“Fracking.” The word says it all. It is short for high-volume hydraulic fracturing. Fracturing destroys the land, water and air. It destroys communities, health, safety and our grandchildren’s futures. The high volume refers to the copious amounts of fresh water used (on average, 5 million gallons per well). Sand and toxic chemicals are used. There is currently no safe place to put the contaminated water when it comes out of the well. It doesn’t all come out. It must be transported by heavy trucks on our roads — to where? In independent studies, all aspects of fracking are being proved to be unsafe. With water contamination, we have air pollution from particulates, which then contaminate the soil. Our food will become contaminated. We are in the Lake Erie watershed, and are risking a major source of the Earth’s drinking water. Decreased crop yields of 30 percent are being shown for farms in “fracked” areas. Grasses and trees near wells die. Wildlife dies, livestock dies and people become sick. The quality of life is ruined, all while we exported 27.5 billion gallons of crude oil and products, including 5.1 billion gallons of gasoline, in 2011. There are earthquakes, property devaluation and the inability to get insurance. I’m originally from Louisiana, and lived in Texas for a number of years. I have seen the total destruction that oil brings with the boom-and-bust cycle. Become proactive. A pro-oil talking point is our ever-increasing need for and use of oil. Consider this: There was no real market for it 100 years ago. Someone sold us a bill of goods. We must sharply reduce our use of oil. We must invest, personally and nationally, in renewables (instead of giving oil subsidies), and get off our oil addiction. My husband and I are farmers. We won an environmental stewardship award in 2011 for work we have done in soil and water conservancy. My husband retired from the U.S. Air Force after a tour in Iraq, and we came home to farm. We are working to eliminate petroleum inputs on our farm within five years. Our website (aggiesrest.com) has more information on reducing use, simplifying and living more sustainably. For the future of all our children, it’s the right thing to do. 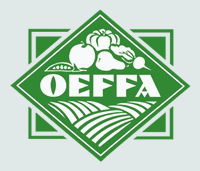 Sheryl Ann Billman is an OEFFA member and was a workshop presenter at the 2012 conference.